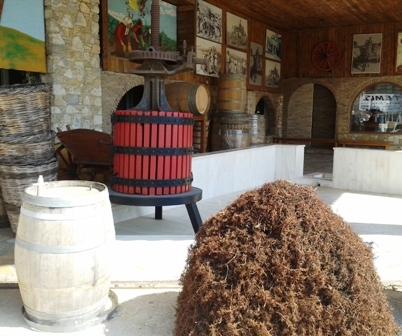 Wine is so vital in Greece that many families have a small wineyard which harvest each year. So, most countrysides including the islands, produce their own wine. The grape harvest season is in the late summer and early fall, like we harvested this year in early September. The weather shapes the timetable of harvesting with the treat of heat or rain which can damage the grapes. The ripeness of the grape like its sugar, acid and tannin levels are also determine the time of the harvest. The grape must be at its sweetest during harvesting time. Sugar is not what makes a wine delicious, but it is a potential alcohol. Grape picking means a little bit dirt, sticky hands, sometimes bees! But don’t worry, with folks many hands make light work! After picking the grapes, we placed them gently in baskets. 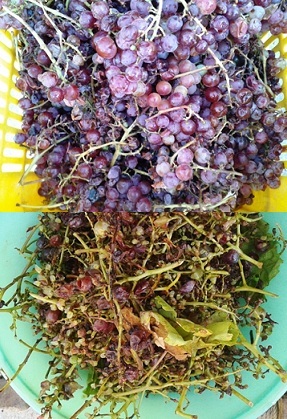 For red winemaking, first the stems of the grapes are removed. 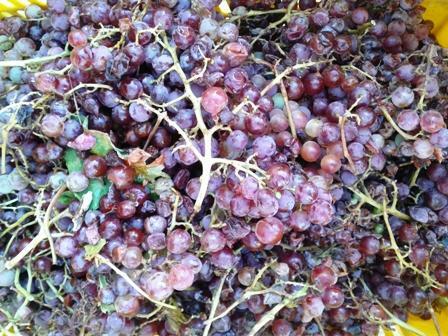 The grape skins give the wine its colour, for that reason, we put the grape skins in the must. The pulp (grape skins) and the juice are allowed to ferment for several weeks, before being transferred to another barrel for aging. The must is made and stored at the storage or most likely the garage. Because it is a dark and a cool place that has all the conditions of a wine cave. You are currently reading Home Grape harvesting~September 2014 at Aegeaneating.